UPDATE AT 2115 KST: Chinese and North Korean state media have confirmed that Kim Jong Un and Xi Jinping met for a second summit in Dalian on Monday and Tuesday. An Air Koryo jet typically used by North Korean leader Kim Jong Un and a large North Korean cargo plane were filmed at China’s Dalian airport on Tuesday by Japanese broadcaster NHK. The presence of the two jets from DPRK national airliner Air Koryo is fuelling speculation that Kim himself may have traveled to the city, though no official confirmation has been made. “At present, I have no news available. China and the DPRK are close neighbors and the two countries maintain normal communication and exchanges,” Chinese foreign ministry spokesperson Geng Shuang said in response to a question on the matter on Tuesday. Footage from the airport itself also showed Chinese military personnel marching in formation towards the private jet, further fueling suggestions that a high-level delegation was on board. The South China Morning Post has reported citing unnamed sources that Chinese President Xi Jinping may be in Dalian this week to oversee a sea launch ceremony for its first fully domestically produced aircraft carrier, though it remains unclear when – or if – this event will take place. Kim’s private jet – named Chammae-1 in state media reports – however, was most recently seen landing at Incheon International Airport on February 9 carrying a high-level delegation of North Koreans traveling to South Korea for the PyeongChang Olympic Games. That delegation included senior DPRK officials and the North Korean leader’s sister Kim Yo Jong, but not Kim Jong Un himself. 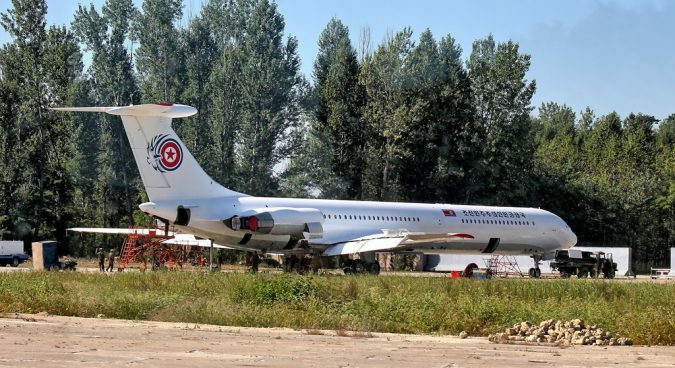 The presence of Air Koryo’s P-914 Ilyushin-76 cargo jet suggests the DPRK delegation visiting China could be carrying significant cargo: the plane can reportedly shift a maximum payload of 50 tons. According to the NK Pro Aviation Tracker, the P-914 was last sighted outside the DPRK on November 4, 2015, when it was photographed at Perm International Airport in Russia. Should Kim have traveled to Dalian, it would represent his second trip to China since assuming power in late 2011, with the DPRK leader having met with Xi Jinping for a Beijing summit in March. At the time, Kim traveled through Dandong on his way to Beijing, however, he did so via train – the same mode of transport his father used for overseas trips. North Korea has been engaged in a flurry of diplomatic activity since the beginning of the year, with Kim also holding a summit with South Korean leader Moon Jae-in on April 29 at Panmunjom along the inter-Korean border. Kim is also scheduled to meet with U.S. President Donald Trump in late May or early June at a location reportedly agreed upon by both sides but not yet officially revealed. Subscribe to read the remaining 508 words of this article.